Our computational models rely on the use of magnetic resonance (MR) imaging techniques, with special sequences and surface coils developed by our collaborators at the Rochester Center for Brain Imaging. With these techniques, we can capture not only the definition of the boundaries between tissues, but also information about the bone structure underlying the cartilage surfaces. Our recent studies have shown that these images may be used to non-invasively predict bone mechanical properties with accuracy comparable to other more invasive techniques such as micro-computed tomography imaging. 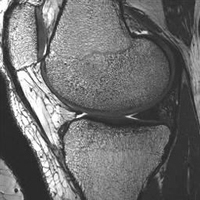 Possible future applications of this technique include clinical research for osteoporosis or osteoarthritis. MR image clearly defines anatomic boundaries and bone structure.